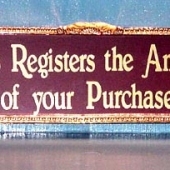 A top sign is a must addition to any antique cash register. 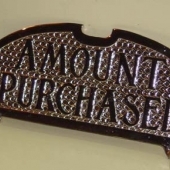 Over the years, cash register top signs were donated for metal drives during World War I, hidden, or simply removed so the clerk could have a better view over the top of the cash register. Therefore, the cash register top sign is the one piece that is almost always missing when purchasing an antique cash register. 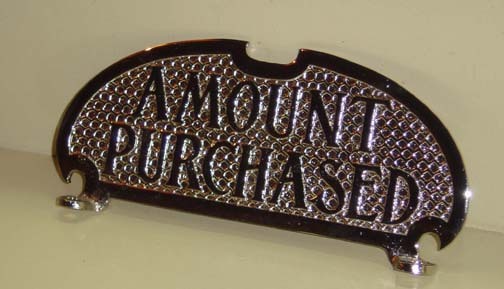 Because original top signs are “scarce”, they also have become a collectible separate and apart from the cash registers they were meant to sit on. All cash register top signs read “Amount Purchased” unless otherwise noted. Nickel plating is available. Prices are for polished signs, drilled with screws. If you have an “unpolished” register, we can sell the sign without lacquer, so that it will change to match the patina of your register. 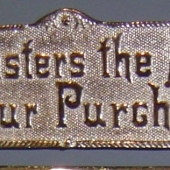 When National made brass cash registers, most of the registers came in red brass (bronze) or nickel plate. A few of the models were available in a copper oxidized finish. Because National had the largest foundry of brass at the turn of the century, if the brass came in different colors, it was nickel plated. If your register has a solid nickel drawer front, it most likely is nickel plate or was originally in nickel plate. Due to the fact these registers are over 100 years old, it is possible that somebody may have stripped off the original nickel plate at some time, and your register is now two or three different colors. This is why we offer some top signs in yellow brass. Below is a photograph of two top signs, the left one in yellow brass and the right one in red brass (bronze). Model 4 Sign (shown in Nickel plate) ~ Fits fine-scroll machines ~ available in red brass or nickel plate ~ Hole Spacing: 17 1/2"
Large Glass sign fits early fine scroll 2, 3, 8, 33, etc ~ available in red brass or nickel plate ~ Custom Glass Available ~ Hole Spacing: 14 3/4"
Fits Model 11 Ionic pattern ~ available in nickel plate only ~ Hole Spacing: 7 1/2"
Fits large Ionic pattern registers,13, 14, 15, etc ~ available in nickel plate only ~ Hole Spacing: 14 3/4"
Fits early fine-scroll candy-store size ~ 0, 5, 12, 30, etc. 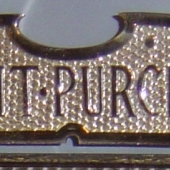 ~ red brass or nickel plate ~ Hole Spacing 8 1/8"
Fits fine scroll machines 2, 3, 7, 8 ~ available in red brass or nickel plate ~ Hole Spacing 14 3/4"
Fits Model 35 with chicken-scratch background ~ available in red brass or nickel plate ~ Hole Spacing 14 3/4"
Fits small fine scroll Model 0, 5, 12, 30, 6 ~ available in red brass or nickel plate ~ Custom Glass Available ~ Hole Spacing 8 1/8"
Fits large style 100 class with Bohemian case such as 138 ~ also fits cast iron 64 ~ nickel plate only ~ Hole Spacing 12"
1000 Class Sign ~ Fits early case design ~ Hole Spacing 9 5/8"